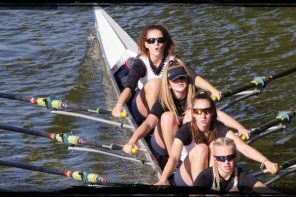 Henley Rowing Club’s junior squad scored a triple win at the competitive Hampton Small Boats Head on Saturday. Racing in a field of 700 boats along the 3000m course from Sunbury Lock, the Henley juniors were competing against some of the major rowing schools and clubs in the south east. The junior women’s squad took the three wins and two second places. 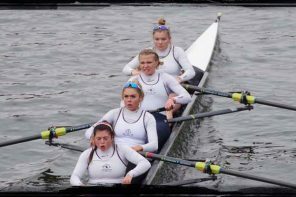 The WJ15 coxed quad of Ruby Brown, Georgie Robinson Ranger, Eve Poulter, Mary Wright and cox Rebecca Lister commanded a field of 18 crews winning in a time of 9 minutes and 5 seconds, some 7 seconds ahead of the second placed boat from Lady Eleanor Holles School. Fellow squad members in this age group, Issy Jonsson and Lottie Orr, competed in the WJ15 double, winning some 28 seconds ahead of the second Henley double of Charlotte Moss and Tilly Lock, pushing LEH School into third place. 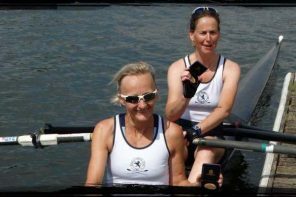 The WJ17 pair of Georgia Edwards and Clare Pearson led a field of 12 crews to win in a time of 10 minutes and a second. In one of the most subscribed events of the Head with 46 crews competing, the WJ16 double of Ella Morgan and Florence Wiggins found themselves in second place by the closest of margins, a tenth of a second, to the winning crew from Maidenhead Rowing Club. In other events, the WJ17 single of Ellie Thompson came fifth in a field of 24 scullers. The WJ pair of Lauren Edwards and Alexis Perkins raced together for the first time and came tenth. The WJ17 pair of Lauren Kay and Lily Stimpson came fourth in their event. 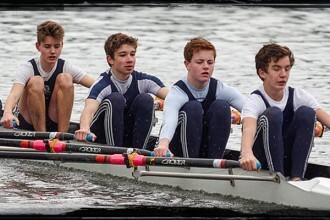 In the junior men’s events, Henley’s J15 coxed quad came a commendable fifth in a busy event of 30 crews. The J15 single of Turnell came sixth of 14 scullers.